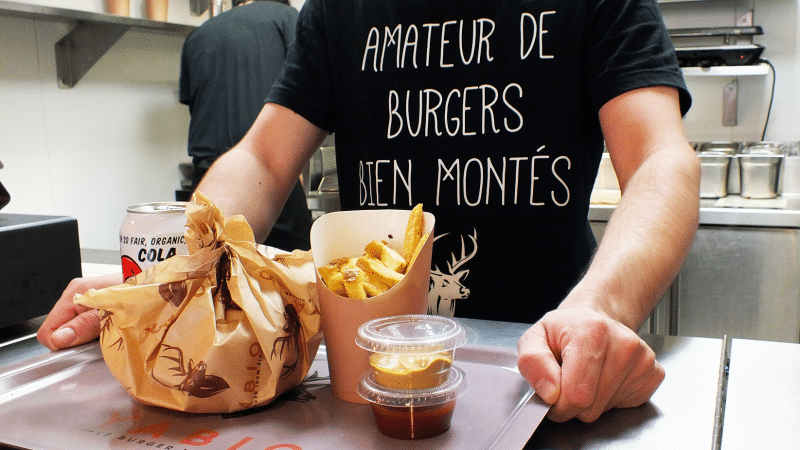 The burger industry is booming in France and Lyon – a city known as the French food capital- is no exception. Here’s a look at five new places where you can find gourmet, healthy and (sometimes) affordable burgers. If you are looking for a gourmet experience in Lyon, you will probably end up on Rue des Marronniers right behind Bellecour square at Les Frangins (Brothers). Between the popular restaurants of the paved street, there is a tiny but always packed venue proposing original gourmet burgers. The Captain Jack’s burger, includes a 180g steak marinated with Jack Daniel’s whiskey, grilled pork belly, roasted onions, cheddar and a homemade barbecue sauce. 9, Rue des Marronniers – Lyon 2 – Subway A/D Bellecour – 04 27 44 26 10 Opening Hours : Noon-2 pm / 7pm-10pm – https://www.facebook.com/lesfranginsJR Around 15 euros for a burger (A lunch formula proposes a burger with French fries for 10 euros). On the other side of the Marronnier street, Yabio is surfing on an even more trendy food habit: All burgers are made with organic products. The veggie burger has a tofu steak, vegetables, salad and gruyere cheese from Savoy. The seasonal burger is made with blue cheese and fig jam. The baker working for the restaurant makes bread in a 16th century mill located just outside of Lyon using an oven from the gallo-roman period! The decoration reflects the singular concept of this burger restaurant with raw materials. Wood, forged iron, stones, copper luminaire no to mention recycling bins and dark green walls. 4 rue des Marronniers, Lyon 2 – Subway Bellecour 69002 Lyon. And 19 rue du Garet, Lyon 1 – Subway Hotel de Ville. Opening Hours : Noon-2pm / 7pm-10pm http://yabio.fr/ Menu with burger, French fries and drink : 12 euros. 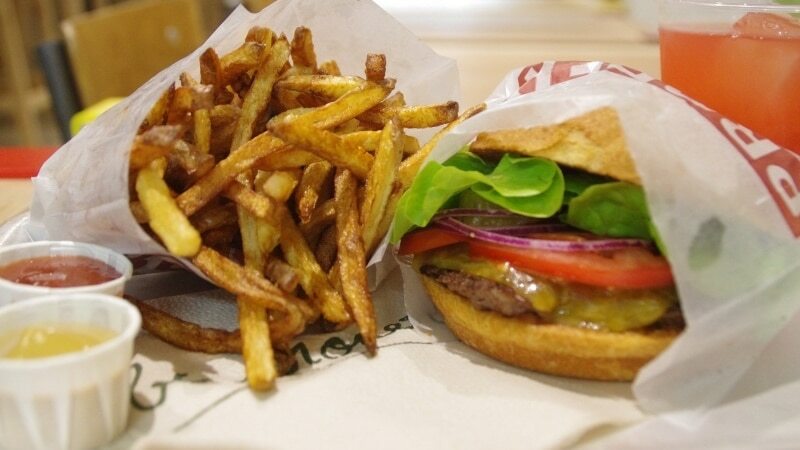 Burger & Wells looks like every other fast food restaurant with one exception: 80% of the ingredients used are organic or locally produced. Vegetables, flour, eggs, tomatoes, milk or cream. The meat is from the Charolais region. A concept created by Camille Candela, a 31 years old cooker who worked in the three Michelin-star restaurant Le Flocon de Sel in Megeve. Nature lover driven by environmental concerns, he opened this brand-new fast food in June 2016 with a back to basics approach. Simple US inspired recipes, a modern design, table tops and stools made with recycled wood. The venue is also a social living space. There is an art workshop for kids once a month, projection of movies and concerts. 18, rue du Bat d’Argent – Lyon 1 – Subway A, C Hotel de Ville. 04 72 07 73 44 – Opening Hours: Sunday through Wednesday : 10 am to 9.30 pm Thursday through Saturday: 10 am to 10.30 pm. 7-9 euros for a burger (10-13 euros for a menu). A new fast-food restaurant has opened in the historic neighborhood of Saint-Georges (Vieux-Lyon) in a former bouchon (a typical Lyon restaurant) with wooden bistro chairs. 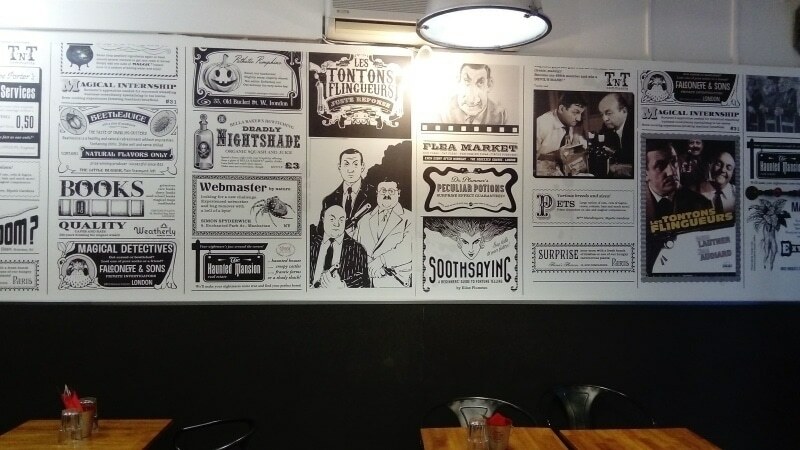 The retro atmosphere of Tonton Burgers is a tribute to the iconic 1963 French movie Les Tontons Flingueurs. The retro atmosphere of Tonton Burgers is a tribute to the iconic 1963 French movie Les Tontons Flingueurs. The venue is decorated with a film poster, black and white drawings, a vintage camera, an old-fashioned telephone and a large chalkboard. The burgers are classic but tasteful with homemade sauces which include mayonnaise, mustard and honey. A place where you feel comfortable eating a burger with fingers. 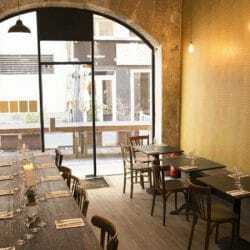 86, rue Saint Georges, Lyon 5 – Subway D Vieux Lyon – 09 54 45 07 51 Closed on Mondays and Friday mornings. Prices: Burger/French fries/drink (11 euros) – Around 8 euros for a burger. Forget about the baguette, French are now addict to buns… Damien Pointet, a former baker took the opportunity to open La Maison du Burger restaurant in Vaise (9th district) in March 2016 boasting of being one of the few burger restaurants to make its own burger buns. There is bread with bacon, olives, sesame, dried tomatoes, nuts or chorizo. The different sauces – ketchup, barbecue, and tartar – are also homemade. The Western is with smoked bacon and tomme cheese is a hit. There is also a new burger every two weeks based on clients suggestions. A modern, welcoming place for professional working in the area. 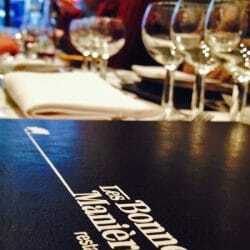 55, Rue de Bourgogne – Lyon 9 – Subway D Gare de Vaise – 04 78 83 76 65. Open on weekdays for lunch and on Friday nights. 11.50 Euros for a burger. Four good restaurants you absolutely have to book before going to Lyon for the Festival of Lights. From “bouchon 2.0 to traditional lyonnais cuisine. Follow the guide.